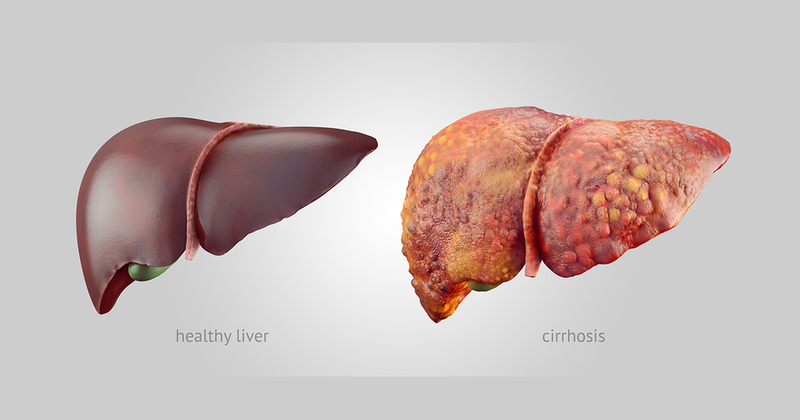 Cirrhosis is a condition which causes irreversible damage to the liver cells. In liver cirrhosis, there is scarring of the liver which leads to abnormalities in its structure and functioning. The liver is responsible for many important body functions like removing toxins, synthesising proteins necessary for clotting and regulating the supply of sugars and fats which the body uses to produce energy. For this reason, it is important that the liver cells function normally. This condition disrupts normal functioning of the liver. As cirrhosis leads to scarring of liver tissue, it obstructs the flow of blood inside the liver. This causes hypertension in the important veins which leads to increased pressure in these veins. This increased pressure can cause rupture of blood vessels in the food pipe and stomach leading to vomiting of blood and also internal bleeding. Bile synthesis and regulation is another important function of the liver. This substance aids in digestion and is responsible for eliminating toxic substances from the body. Bile is transported through channels called canaliculi which ensure it reaches the intestine where it enables digestion and removes toxins in the stool. Cirrhosis destroys the relationship between the liver cells and canaliculi and also makes these ducts abnormal. This results in the inability to eliminate toxins form the body which results in their accumulation. Preventing further damage to the liver- It is extremely important to diagnose the condition leading to liver cirrhosis (like hepatitis virus infection, fatty liver, alcohol intake) so that adequate steps can be taken to treat it and prevent further damage to liver. Medication and treatment to deal with the complications of cirrhosis- swelling of legs and distension of abdomen would need intensive medical treatment. Internal bleeding needs to be tackled with endoscopy. Prevention and/or early detection of liver cancer- Liver cirrhosis increases the risk of the patient to develop liver cancer. Regular check-ups by your liver specialist can help diagnose it in very early stage so that adequate treatment can be provided. Liver transplant – If the liver cirrhosis is in advanced stage, a liver transplant can completely cure the patient.